Scan QR/barcodes with your NativeScript app. Note that running this only makes sense on a real device. When either (or both) of these are specified, both can be returned. You can check the actual type by inspecting the format property of the result object. For details, see #176. If you need to embed the scanner for Android as well, please consider using the Machine Learning powered Barcode scanner I've added to the ML Kit feature of the NativeScript Firebase plugin! As you can see, you can style the view any way you like, and even overlay it with an image or button. To recreate the layout above, look at these lines in the demo app. Here's an example tag, showing all currently supported options. The property defaults are equal to the scan function. See 'demo-ng' for details. Do not run it for Android, because embedding a view is not supported on that platform. iOS 10+ requires not only this popup, but also a reason. In this case it's "We'd like to use the Camera ..". To not crash your app in case you forgot to provide the reason this plugin adds an empty reason to the .plist during build. This value gets overridden by anything you specify yourself. Tip: during a scan you can use the volume up/down buttons to toggle the torch. Note that result.format above is one of these. 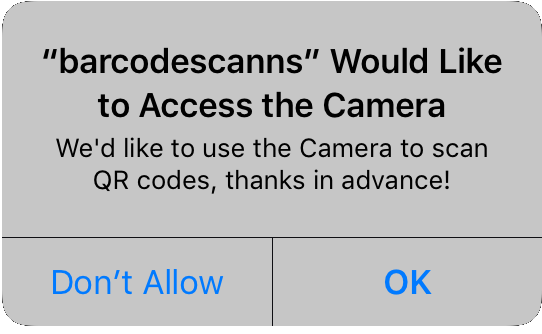 orientation: "landscape",     // Android only, optionally lock the orientation to either "portrait" or "landscape"
In this mode the scanner will continuously report scanned codes back to your code, but it will only be dismissed if the user tells it to, or you call stop programmatically. The plugin handles duplicates for you so don't worry about checking those; every result withing the same scan session is unique unless you set reportDuplicates to true. // this callback will be invoked for every unique scan in realtime! Note that the iOS implementation will always return true at the moment, on Android we actually check for a camera to be available. On Android 6+ you need to request permission to use the camera at runtime when targeting API level 23+. Even if the uses-permission tag for the Camera is present in AndroidManifest.xml. On iOS 10+ there's something similar going on. Since version 1.5.0 you can let the plugin handle this for you (if need be a prompt will be shown to the user when the scanner launches), but if for some reason you want to handle permissions yourself you can use these functions. When using Angular 2, it is best to inject dependencies into your classes. Here is an example of how you can set up nativescript-barcodescanner in an Angular 2 app with dependency injection. //use the barcodescanner wherever you need it. See general usage above.